Anyone who’s gone through my Flickr photostream knows that I’ve visited the Fort De Chartres (IL) Rendezvous several times over the past few years. A rendezvous is a gathering of historical re-enactors, usually over a weekend, wherein they camp and dress in period. It’s an opportunity for us non-re-enactors, “Flatlanders,” to see and experience some “living history.” Some places have rendezvous, some have encampments, some have historical re-enactments, but by whatever name they go by, the participants take their re-creations of period garb and lifestyle seriously. A couple of weeks ago, I went to an Encampment I’d never been to before, at Fort Massac, in southern Illinois, near Metropolis, Illinois. 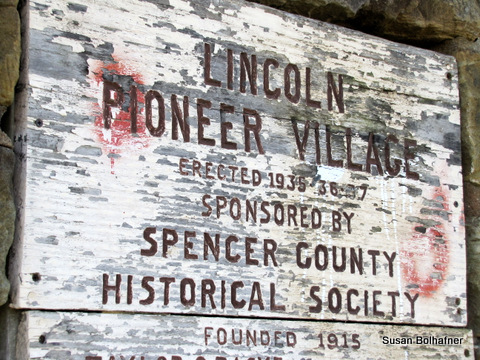 I enjoyed it so much, I went looking for events, and found, in a Google search, an event in Rockport, Indiana, at the Lincoln Pioneer Village. Rockport, Indiana, is a little over three hours’ drive from St. Louis, roughly about the same drive time as going to Fort Massac. Saturday morning was brisk, 44degrees Fahrenhight when we left. Misha, my SO, my best friend and my favorite confidante, agreed (sleepily) to ride shotgun, as long as he could take his headphones and Kindle. When we got to the venue, I have to admit, I was a little disappointed. From the approach, the Pioneer Village doesn’t look like much, but I’ll say now, it was well worth the trip. 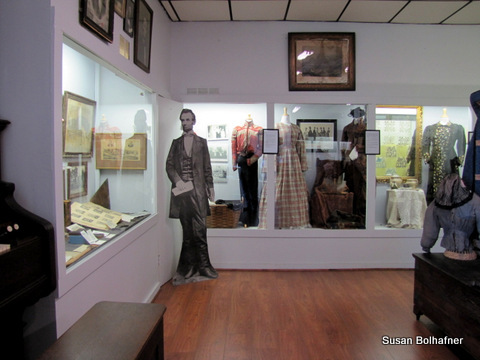 Mostly run by volunteers, the staff is friendly and knowledgable about their town, their museum and their artifacts; in fact, many of the artifacts were donated by families known by the volunteers, so there’s a strong sense of connection here. These aren’t just things. 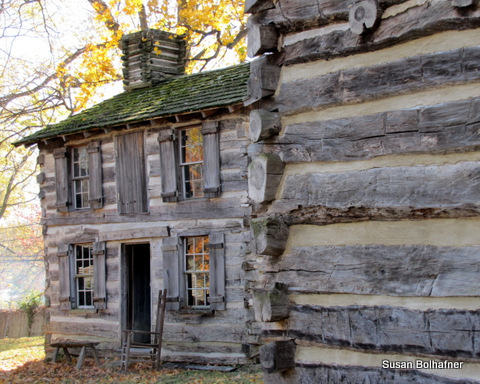 The Lincoln Pioneer Village was the baby of Rockport native, George Honig, a noted sculptor and Lincoln historian, and is a recreation of the village that Abraham Lincoln, 16th President of the United States, grew up in from 1816 to 1830. 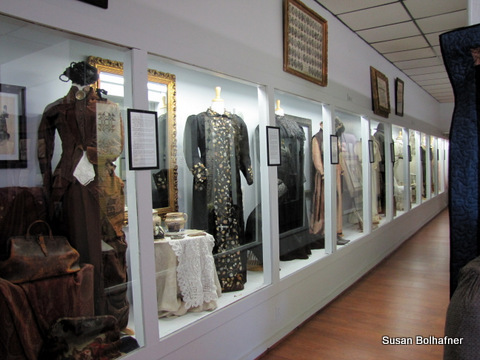 After viewing the artifacts in the main museum building, you exit through the back doors into the Village setting. There are over a dozen buildings, built in the 1930s through Federal Emergency Relief Administration and WPA funds. Each building “replicated on that had actually existed in Rockport or at various sites in the county.” The work was completed in 1936. The buildings include the John Pitcher Law Office, from whom young Lincoln borrowed books to read; the Little Pigeon Baptist Church (a replica of the structure that Lincoln and his father helped build; the Colonel (William) Jones Store, where Lincoln was a clerk; as well as many others. This place is just plain fun. Entering and viewing the buildings is very much like stepping back in history. The floors are either dirt, stone or plank, and there’s not much to protect you from the elements. As a visitor, it pays to be careful and watch your footing, because the steps into a building may not be more than a large, flat fieldstone. (The out-buildings are not ADA accessible that I could tell, but call ahead.) 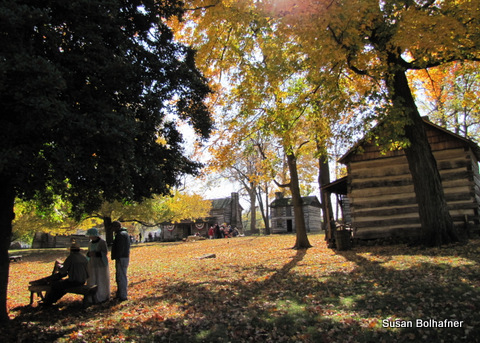 On this particular Saturday, the Lincoln Pioneer Village was celebrating their Historical Timeline Rendezvous. There were several people in period dress, demonstrating skills such as candle-dipping, ax throwing, and weaving. While extremely small when compared to the Rendezvous at Forts Massac or De Chartres, the very intimacy of the location, coupled with the permanence of the Village (as opposed to the tents that usually make up a Rendezvous), gave this event a nice Way-Back Machine feel. And with lots of open space in the Village proper, it’s a great place to let the kids run amok. A day like any other day, except I was there.